Translator’s note: This discourse opens the Samyutta Nikaya with a paradox. The Commentary informs us that the Buddha teaches the devata in terms of the paradox in order to subdue her pride. To give this paradox some context, you might want to read other passages from the Canon that discuss right effort. That is what the devata said. The Teacher approved. Realizing that “The Teacher has approved of me,” she bowed down to him, circumambulated him — keeping him to her right — and then vanished right there. 1. Or: “unestablished.” See Ud 8.1. Related references are in SN 12.38 and SN 12.64. Map of the Maurya Empire under Ashoka’s rule. The Sanchi stupa in Sanchi, Madhya Pradesh established by emperor Ashoka in the third century BC. Fragment of the 6th Pillar Edicts of Ashoka (238 BC), in Brahmi, sandstones. British Museum. Silver punch-mark coins of the Mauryan empire, bear Buddhist symbols such as the Dharmacakra, the elephant (previous form of the Buddha), the tree under which enlightenment happened, and the burial mound where the Buddha died (obverse). 3rd century BC. Distribution of the Edicts of Ashoka and Ashokan territorial limits. Greek Late Archaic style capital from Patna (Pataliputra), thought to correspond to the reign of Ashoka, 3rd century BC, Patna Museum (click image for references). 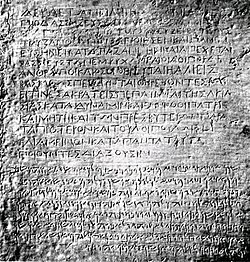 Bilingual edict (Greek and Aramaic) by king Ashoka, from Kandahar - Afghan National Museum. (Click image for translation). Buddhist proselytism at the time of king Ashoka (260-218 BC), according to his Edicts. “The legend of King Asoka, A study and translation of the Asokavadana“, John Strong, Princeton Library of Asian translations. This is the famous original sandstone sculpted Lion Capital of Ashoka preserved at Sarnath Museum which was originally erected around 250 BCE atop an Ashoka Pillar at Sarnath. The angle from which this picture has been taken, minus the inverted bell-shaped lotus flower, has been adopted as the National Emblem of India showing the Horse on the left and the Bull on the right of the Ashoka Chakra in the circular base on which the four Indian lions are standing back to back. On the far side there is an Elephant and a Lion instead. The wheel “Ashoka Chakra” from its base has been placed onto the center of the National Flag of India. Those who practice the Dhamma will begin to know the Dhamma or to gain a feel for the Dhamma in the area of meditation more markedly than in other areas, and more extensively. For example, the gratification that comes from being generous is moving in one way, the gratification that comes from maintaining the precepts is moving in another way, the feelings of gratification that come from the different forms of goodness are moving in their own separate ways. This is called finding gratification in skillfulness. But all of these feelings of gratification converge in the practice of meditation. We begin to feel moved from the moment the mind begins to grow still, when the heart gathers its currents together to stand solely on its own. Even though we may not yet obtain a great deal of stillness from the inward gathering of the mind, we still find ourselves gratified within, in a way we can clearly sense. If the mind or the Dhamma were a material object, there wouldn’t be anyone in the world who wouldn’t respect the religion, because the goodness, the well-being, and the marvels that arise from the religion and from the practicing in line with the teachings of the religion are things desired the world over. Goodness, well-being, marvels: These are things the world has always desired from time immemorial — with a desire that has never lost its taste — and they are things that will always be desired until the world loses its meaning, or until people become extinct, having no more sense of good and evil. That’s when the world will no longer aspire for these great blessings. The well-being that comes from the marvels — the Dhamma in the area of its results — is something to which all living beings aspire, simply that their abilities differ, so that some attain their aspirations, while others don’t. But the Dhamma can’t be displayed for the world to perceive with its senses of sight, hearing, smell, taste, or touch in the way other things can. Even though there may be other immaterial phenomena similar to the Dhamma — such as smells — still they aren’t like the true Dhamma that is touched by the hearts of those who have practiced it. If the Dhamma could be displayed like material objects, there is no doubt but that the human world would have to respect the religion for the sake of that Dhamma. This is because the Dhamma is something more marvelous than anything else. In all the three levels of existence, there is no greater marvel than in the Dhamma. The Dhamma can appear as a marvel, conspicuous and clear in the mind. The mind is what knows it — and only the mind. It can’t be displayed in general like material objects, as when we take things out to admire or to show off to others. The Dhamma can’t possibly be displayed like material objects. This is what makes the world lack interest — and lack the things that could be hoped from the Dhamma — in a way that is really a shame. Even those who want the marvel of the Dhamma don’t know what the marvel is, or what the profundity of the Dhamma is, because the mind has never had contact with that profundity. The eye has never had contact with the marvel. The ear has never obtained any marvel from the current of the Dhamma, because the Dhamma can’t be displayed as a current of sound as other things can. This is one obstacle that prevents people from becoming moved by the Dhamma, that prevents them from fully believing and fully entrusting themselves to the Dhamma in a way consistent with the world’s long-felt hunger for well-being and prosperity. Each of the Buddhas who has gained Awakening and taught the Dhamma to the world has had to reflect to the full extent of his intelligence and ability on the myriad ways of teaching the Dhamma to the world so that the world could see it as a marvel, inasmuch as the Dhamma can’t be put in shop windows or in public places. This is because the true Dhamma lies in the heart and reveals itself only in words and deeds, which doesn’t excite a gratifying sense of absorption in the same way as touching the Dhamma directly with the heart. Because there is no way to display the Dhamma directly, the Buddhas display it indirectly through teaching. They point out the causes — the Dhamma of conduct and practices leading to the Dhamma of results at this or that point or this or that level; and at the same time they proclaim the results — the excellence, the marvels of the stages and levels of the Dhamma that can be touched with the heart, all the way to the highest marvel, vimutti, the mental release called nibbana within the heart. Every Buddha has to devise strategies in teaching the Dhamma so as to bring that marvel out to the world by using various modes of speech and conduct — for example, describing the Dhamma and showing the conduct of the Dhamma as being like this and that — but the actual Dhamma can’t be shown. It is something known exclusively in the heart, in the way in which each Buddha and each arahant possesses this marvel. None of the Buddhas, none of the arahants who possess this marvel are in any way deficient in this regard. The marvel lies in their hearts — simply that they can’t take the marvel that appears there and display it in the full measure of its wonder. Thus they devise strategies for displaying it in their actions, which are simply attributes of the Dhamma, not the actual Dhamma itself. For instance, the doctrine they teach in the texts is simply an attribute of the Dhamma. Their act of teaching is also just an attribute of the Dhamma. The actual Dhamma is when a meditator or a person who listens to their teachings about the Dhamma follows the Dhamma in practice and touches it stage by stage within his or her own heart. This is called beginning to make contact with the actual Dhamma, step by step. However much contact is made, it gives a sense of gratification felt exclusively within the heart of the person who has gained that contact through his or her own practice. When it comes to ingenuity in teaching, no one excels the Buddhas. Even so, they reveal only what they see as appropriate for humanity. They can’t reveal the actual Dhamma — for example, by taking out the true marvel in their hearts and unfolding it for the world to see, saying, ‘This is the marvel of the Tathagata, of each Buddha. Do you see it?’ This can’t be done, for here we’re talking about the marvel of the purity of a heart that was previously swamped with defilement like a heap of assorted excrement, but now has become a pure, unsullied nature, or a pure, amazing nature because of the practice of constantly and relentlessly cleansing it. They can’t show that Dhamma to the world, saying, ‘Do you see this? Look at it. Look at it. Feast your eyes till they’re full and then strive to make this treasure your own!’ So instead, they teach by using various strategies for those who practice, describing the path in full detail, in terms both of causes and of results. What they bring out to show is simply the current of their voices, the breath of their mouths. That’s what they bring out to speak, simply the breath of their mouths. They can’t bring out the real thing. For example, when they say, ‘It’s marvelous like this,’ it’s just sound. The marvelous nature itself can’t be brought out. All they can bring out is the action of saying, ‘That nature is marvelous,’ so that we can speculate for ourselves as to what that marvel is like. Even though this doesn’t remove our doubts, it’s better than if we had never heard about it at all. But the basic principle in making us come to know and see the marvel of the Dhamma is that first we have to speculate and then we follow with practice. This qualifies as following the principles of the Dhamma the Buddha taught, and this is fitting and proper. No matter what the difficulties and hardships encountered in following the path, we shouldn’t let them form barriers to our progress, because this is where the path lies. There are no other byways that can take us easily to the goal. If our practice is difficult, we have to stick with it. If it’s painful, we have to bear it, because it’s a duty we have to perform, a burden we have to carry while working so as to attain our aims. The Dhamma of a pure mind is like this: The mind is the Dhamma, the Dhamma is the mind. We call it a mind only as long as it is still with the body and khandhas. Only then can we call it a pure mind, the mind of a Buddha, or the mind of an arahant. After it passes from the body and khandhas, there is no conventional reality to which it can be compared, and so we can’t call it anything at all. No matter how marvelous that nature, no matter how much it may be ours, there is no possible way we can use conventional realities to describe it or to make comparisons, because that Dhamma, that realm of release, has no conventions against which to measure things or make comparisons. It’s the same as if we were in outer space: Which way is north, which way is south, we don’t know. If we’re on Earth, we can say ‘east,’ ‘west,’ ‘north,’ and ’south’ because there are things that we can observe and compare so as to tell which direction lies which way. We take the Earth as our standard. ‘High’ and ‘low’ depend on the Earth as their frame of reference. How much higher than this, lower than this, north of this, south of this: These things we can say. But if we’re out in outer space, there is no standard by which we can measure things, and so we can’t say. Or as when we go up in an airplane: We can’t tell how fast or how slow we’re going. When we pass a cloud, we can tell that we’re going fast, but if we depend simply on our eyesight, we’re sure to think that the speed of the airplane is nowhere near the speed of a car. We can clearly see how deceptive our eyesight is in just this way. When we ride in a car, the trees on both sides of the road look as if they were falling in together down on the road behind us. Actually, they stay their separate selves. It’s simply that the car runs past them. Since there are things that we sense, that lie close enough for comparison, it seems as if the car were going really fast. As for the airplane, there’s nothing to make comparisons with, so it looks as if the plane were dawdling along, as if it were going slower than a car, even though it’s actually many times faster. This is how it is when we compare the mind of an ordinary run-of-the-mill person with the mind of the Buddha. Whatever the Buddha says is good and excellent, we ordinary people tend to say that it’s not. Whatever we like, no matter how vile, we say that it’s good. We don’t admit the truth, in the same way as thinking that a car goes faster than an airplane. The practice of attending to the mind is something very important. Try to develop mindfulness (sati) and discernment so that they can keep up with the things that come and entangle the mind. By and large, the heart itself is the instigator, creating trouble continually, relentlessly. We then fall for the preoccupations the heart turns out — and this makes us agitated, upset, and saddened, all because of the thoughts formed by the heart. These come from the heart itself, and the heart itself is what falls for them, saying that this is this, and that is that, even though the things it names ‘this’ and ‘that’ merely exist in line with their nature. They have no meaning in and of themselves, that they are like ‘’this’ or ‘that.’ The mind simply gives them meanings, and then falls for its own meanings, making itself glad or sad over those things without end. Thus the stress and suffering that result from thought-formations have no end, no point of resolution, just as if we were floating adrift in the middle of the sea waiting to breathe our last breath. The Buddhas all reached Awakening here in this human world because the human world is rich in the Noble Truths. It’s where they are plain to see. The Noble Truth of stress (dukkha) lies in the human body. Human beings know about stress — because they’re smarter than common animals. The Noble Truth of the origin of stress: This lies in the human heart. The Noble Truth of the path — the path of practice to cure defilement (kilesa), craving (tanha), and mental effluents (asava), which are the things that produce stress: This, human beings also know. What is the path? To put it briefly: virtue, concentration, and discernment. These things human beings know and can put into practice. The Noble Truth of the cessation of stress: This, human beings also know. No matter which of these truths, all human beings know them — although they may not know how to behave toward them or take interest in behaving in line with them, in which case there is no way the Dhamma can help them at all. The Buddhas thus taught the Dhamma in the human world, because the human world lies in the center of all the levels of existence. We have been born in the center of existence, in the midst of the religion. We should conform correctly to the central point of the religion, so as to comprehend the religion’s teachings that lie in the center of our heart. The superlative Dhamma lies right here. It doesn’t lie anywhere else. The mind is what can reach the Dhamma. The mind is what knows all dhammas. The affairs of the Dhamma, then, do not lie beyond the mind, which is a fitting vessel for them. Good, evil, pleasure, pain: The mind knows these things before anything else knows them, so we should develop mindfulness and discernment to be resourceful, to keep up with the events that are always becoming involved with the mind in the course of each day. If we’re intent on investigating the origin of stress, which fans out from our various thought-formations, we will find that it arises without stop. It arises right here in the mind. It’s fashioned right here. Even though we try to make it quiet, it won’t be still. Why? Because of the ‘unquietness’, the thoughts with which the mind disturbs itself, which it forms and sends out towards its preoccupations (arammana) all the time. Once the mind sends out its thoughts, it then gathers in stress for itself. It keeps at it, in and out like this. What goes out is the origin of stress, and what comes back in is stress. In other words, thoughts form and go out as the origin of stress, and when the results come back to the heart, they’re stressful. These things are constantly being manufactured like this all the time. When we want the mind to have even just a little bit of calm, we really have to force it; and even then these things still manage to drive the mind into forming thoughts whenever we let down our guard. This is how it is with the origin of stress, which is constantly producing suffering. It lies in the heart and is always arising. For this reason, we must use mindfulness and discernment to diagnose and remedy the origin of stress, to keep an eye out for it, and to snuff it out right there, without being negligent. Wherever we sit or stand — whatever our activity — we keep watch over this point, with mindfulness alert to it, and discernment unraveling it so as to know it constantly for what it truly is. All those who practice to remove defilement practice in this way. In particular, those who are ordained practice by going into the forest to look for a place conducive to their striving in order to wipe out this very enemy. Even when they stay in inhabited areas, or wherever they go, wherever they stay, they keep their attention focused continually, step by step, on the persistent effort to remove and demolish the origin of stress, which is a splinter, a thorn in the heart. Such people are bound to develop more and more ease and well-being, step by step, in proportion to the persistence of their striving. We can see clearly when the mind is still and settles down: Thought-formations are still, or don’t exist. Turmoil and disturbances don’t occur. The stress that would otherwise result doesn’t appear. When the mind is quiet, stress is also quiet. When thought-formations are quiet, the origin of stress is also quiet. Stress is also quiet. All that remains at that moment is a feeling of peace and ease. The war between the mind and the defilements causing stress is like this. We have to keep fighting with persistence. We have to use mindfulness and discernment, conviction and persistence to contend with the war that disturbs and ravages the mind, making it stagger and reel within. The disturbances will then gradually be suppressed. Even when there is only a moment of quiet, we will come to see the harm of the thought-formations that are constantly disturbing us. At the same time, we will see the benefits of mental stillness — that it’s a genuine pleasure. Whether there is a lot of stillness or a little, pleasure arises in proportion to the foundation of stillness or the strength of the stillness, which in the texts is called samadhi, or concentration. A mind centered and still is called a mind in concentration, or a mind gathered in concentration. This is what genuine concentration is like inside the heart. The names of the various stages of concentration are everywhere, but actual concentration is inside the heart. The heart is what gives rise to concentration. It produces it, makes it on its own. When concentration is still, the mind experiences cool respite and pleasure. It has its own foundation set firmly and solidly within. It’s as if we were under an eave or under the cooling shade of a tree. We’re comfortable when it rains, we’re comfortable when the sun is out, because we don’t have to be exposed to the sun and rain. The same holds true with a mind that has an inner foundation of stillness: It’s not affected by this preoccupation or that, which would otherwise disturb and entangle it repeatedly, without respite. This is because stillness is the heart’s dwelling — ‘concentration,’ which is one level of home for the heart. Discernment (pañña) is ingenuity, sound judgment, evaluating causes and effects within and without; above, below, and in between — inside the body — all the way to the currents of the mind that send out thoughts from various angles. Mindfulness and discernment keep track of these things, investigating and evaluating them so as to know causes and effects in terms of the heart’s thought-formations, or in terms of the nature of sankhara within us, until we see the truth of each of these things. Don’t go investigating these things off target, by being clever with labels and interpretations that go against the truth — because in the investigation of phenomena, we investigate in line with the truth. We don’t resist the truth, for that would simply enhance the defilements causing stress at the very moment we think we’re investigating phenomena so as to remove them. Birth we have already experienced. As for old age, we’ve been growing old from the day of our birth, older and older, step by step. Whatever our age, that’s how long we’ve been growing old, until we reach the end of life. When we’re old to the nth degree, we fall apart. In other words, we’ve been growing old from the moment of birth — older by the day, the month, the year — older and older continually. We call it ‘growing up’, but actually it’s growing old. See? Investigate it for what it really is. This is the great highway — the way of nature. Don’t resist it. For example, the body is growing old, but we don’t want it to be old. We want it always to be young. This is called resisting the truth — which is stress. Even when we try to resist it, we don’t get anywhere. What do we hope to gain by resisting it and creating stress for ourselves? Actually, we gain nothing but the stress that comes from resisting the truth. Use discernment to investigate just like this. Whenever pain arises in any part of the body, if we have medicine to treat it, then we treat it. When the medicine can take care of it, the body recovers. When the medicine can’t, it dies. It goes on its own. There’s no need for us to force it not to die, or to stay alive for so-and-so many years, for that would be an absurdity. Even if we forced it, it wouldn’t stay. We wouldn’t get any results and would just be wearing ourselves out in vain. The body has to follow its own natural principles. When we investigate in line with its truth this way, we can be at our ease. Wherever there’s pain, keep aware of it continually in line with its truth. Whether it hurts a lot or a little, keep aware of its manifestations until it reaches the ultimate point of pain — the death of the body — and that’s as far as it goes. Know it in line with its truth. Don’t resist it. Don’t set up any desires, because the setting up of desire is a deficiency, a hunger. And hunger, no matter when or what the sort, is pain: Hunger for sleep is pain, hunger for food is pain, hunger for water is pain. When was it ever a good thing? The hunger, the desires that arise, wanting things to be like this, wanting them to be like that: These are all nothing but disturbances, issues that give rise to stress and pain. This is why the Buddha doesn’t have us resist the truth. Use your discernment to investigate, to contemplate in line with the natural principles of things as they already are. This is called discernment that doesn’t fly in the face of truth — and the heart can then be at ease. We study the four ‘Noble Truths’ here in our body. In other words, we study birth, aging, illness, and death, all of which lie in this single heap of elements (dhatu) without ever leaving it. Birth is an affair of these elements. Growing up or growing old, it’s old right here. When there’s illness, it manages to be ill right here, in one part or another. When death comes, it dies right here. So we have to study right here — where else would we study? We have to study and know the things that involve us directly before we study anything else. We have to study them comprehensively and to completion — studying our own birth, our aging, our illness and pain, and completing our study of our own death. That’s when we’ll be wise — wise to all the events around us. People who know the Dhamma through practicing so that they are wise to the events that occur to themselves, do not flinch in the face of any of the conventional realities of the world at all. This is how it is when we study the Dhamma, when we know and see the Dhamma in the area of the heart — in other words, when we know rightly and well. ‘Mindfulness and discernment that are wise all around themselves’ are wise in this way, not wise simply from being able to remember. They have to be wise in curing doubt, in curing the recalcitrance of the heart, as well as in curing their own attachments and false assumptions so as to leave only a nature that is pure and simple. That’s when we’ll be really at ease, really relieved. Let the khandhas be khandhas pure and simple in their own way, without our messing with them, without our struggling with them for power, without our forcing or coercing them to be like this or like that. The khandhas are then khandhas, the mind is then the mind, each with its own separate reality, each not infringing on the others as it used to. Each performs its own duties. This is called khandhas pure and simple, the mind pure and simple, without any conventional realities adulterating them. What knows is what knows, the elements are elements, the khandhas are khandhas. Whatever things may break apart, let them break apart. We have already known them clearly with our discernment. We have no doubts. We’ve known them in advance, even before they die, so when death comes, what doubts can we have? — especially now that they display the truth of their nature for us to see clearly. This is called studying the Dhamma, practicing the Dhamma. To study and practice this way is to follow the same way that sages have practiced and known before us. All of these conditions are matters of conventional reality — matters of the elements, the khandhas, or the sense media (ayatana). The four khandhas, the five khandhas, whatever, are individual conditions, individual conditions that are separated in line with conventions. Discernment is also a condition; and mindfulness, another condition — conditions of the heart — but they’re Dhamma, means of curing the mind that is clouded and obscured, means of washing away the things that cloud and obscure it, until radiance appears through the power of the discernment that cleanses the heart. Once the heart is radiant, in the next step it becomes pure. When the tasks we have had to do — abandoning and striving — are done to completion, we know right here, because delusion lay right here in the heart. We study and practice simply to cure our own delusion. Once we know right here, and delusion is gone, what else is there to know? — for beyond this there is nothing further to know. What else is there for us to be deluded about? We’re no longer deluded, because we know fully all around. This very state of mind: When at the beginning I referred to the superlative Dhamma, the marvelous Dhamma, I was referring to this very state of mind, this very Dhamma — but it’s something known exclusively within itself, and exists only within itself. It’s marvelous — this we know within our own mind. It’s superlative — this we also know within our own mind. We can’t take it out or unfurl it like other things for other people to see. So if you want to have any Noble Treasures to show for yourself, practice. Remove all those dirty stains from the heart, and the superlative things I have mentioned will appear by their own nature — in other words, they will appear in the mind. This is called completing your study of the Dhamma; and your study of the world is completed right here. The ‘world’ means the world of elements, the world of the khandhas that lie right here with each of us, which are more important than the worlds of elements and khandhas belonging to other people, because this world of elements and khandhas lies with us and has been weighing on the heart all along. Once we have reached this level, we can live wherever we like. The war is ended — the war between the mind and defilement, or the war between Dhamma and defilement, is over. This is where we dismantle being and birth. This is where we dismantle the heap of suffering in the round of rebirth — right here in the heart. Since the heart is the wanderer through the cycle of rebirth, we have to dismantle things right here, to know them right here. Once we know, that’s the end of all problems right here. In this whole wide world there are no problems. The only problem was the issue of the heart that was deluded about itself and about the things that became involved with it. Now that it has completely rectified the way it is involved with things, there is nothing left — and that’s the end of the problem. From this point on, there are no more problems to trouble the heart until the day of its total nibbana. This is how the Dhamma is studied to completion. The world — the world of elements and khandhas — is studied to completion right here. So keep striving in order to see the marvel described at the beginning, which was described in line with the truth with no aspect to invite any doubt. The Buddha and the Noble Disciples have Dhamma filling their hearts to the brim. You are a disciple of the Tathagata, with a mind that can be made to show its marvelousness through the practice of making it pure, just like the Buddha and the Noble Disciples. So try to make it still and radiant, because the heart has long lain buried in the mud. As soon as you can see the harm of the mud and grow tired of it, you should urgently wake up, take notice, and exert yourself till you can manage to make your way free. Nibbana is holding its hand out, waiting for you. Aren’t you going to come out? Rebelliousness is simply distraction. The end of rebelliousness is stillness. When the heart is still, it’s at ease. If it’s not still, it’s as hot as fire. Wherever you are, everything is hot and troubled. Once it is still, then it’s cool and peaceful wherever you are — cool right here in the heart. So make the heart cool with the practice, because the heat and trouble lie with the heart. The heat of fire is one thing, but the heat of a troubled heart is hotter than fire. Try to put out the fires of defilement, craving, and mental effluents burning here in the heart, so that only the phenomenon of genuine Dhamma remains. Then you will be cool and at peace, everywhere and always. And so I’ll ask to stop here. The first two steps in the process of becoming a lay disciple of the Buddha are the going for refuge (sarana gamana) and the undertaking of the five precepts (pañca-sila samadana). By the former step a person makes the commitment to accept the Triple Gem — the Buddha, the Dhamma, and the Sangha — as the guiding ideals of his life, by the latter he expresses his determination to bring his actions into harmony with these ideals through right conduct. The following two tracts were written for the purpose of giving a clear and concise explanation of these two steps. Though they are intended principally for those who have newly embraced the Buddha’s teaching they will probably be found useful as well by long-term traditional Buddhists wanting to understand the meaning of practices with which they are already familiar and also by those who want to know what becoming a Buddhist involves. In order to keep our treatment compact, and to avoid the intimidating format of a scholastic treatise, references to source material in the tracts themselves have been kept to a minimum. Thus we here indicate the sources upon which our account has drawn. Going for Refuge is based primarily upon the standard commentarial passage on the topic, found with only minor variations in the Khuddakapatha Atthakatha (Paramatthajotika), the Dighanikaya Atthakatha (Sumangalavilasini), and the Majjhimanikaya Atthakatha (Papañcasudani). The first has been translated by Ven. Bhikkhu Ñanamoli in Minor Readings and the Illustrator (London: Pali Text Society, 1960), the third by Ven. Nyanaponika Thera in his The Threefold Refuge (B.P.S., The Wheel No. 76.). The tract Taking the Precepts relies principally upon the commentarial explanations of the training rules in the Khuddakapatha Atthakatha, referred to above, and to the discussion of the courses of kamma in the Majjhimanikaya (commentary to No. 9, Sammaditthisutta). The former is available in English in Ven. Ñanamoli’s Minor Readings and Illustrator, the latter in Right Understanding, Discourse and Commentary on the Sammaditthisutta, translated by Bhikkhu Soma (Sri Lanka: Bauddha Sahitya Sabha, 1946). Another useful work on the precepts was The Five Precepts and the Five Ennoblers by HRH Vajirañanavarorasa, a late Supreme Patriarch of Thailand (Bangkok: Mahamakut Rajavidyalaya Press, 1975). Also consulted was the section on the courses of karma in Vasubandhu’s Adhidharmakosa and its commentary, a Sanskrit work of the Sarvastivada tradition. I go for refuge to the Sangha. As slight and commonplace as this step might seem, especially in comparison with the lofty achievements lying beyond, its importance should never be underestimated, as it is this act which imparts direction and forward momentum to the entire practice of the Buddhist path. Since the going for refuge plays such a crucial role it is vital that the act be properly understood both in its own nature and in its implications for future development along the path. To open up the process of going for refuge to the eye of inner understanding, we here present an examination of the process in terms of its most significant aspects. These will be dealt with under the following eight headings: the reasons for taking refuge; the existence of a refuge; the identification of the refuge objects; the act of going for refuge; the function of going for refuge, methods of going for refuge; the corruption and breach of the going for refuge; and the similes for the refuges.